Ideally, healthy humans have...a gift for risk-taking... the strength to learn from experience... [and] the ability to risk enchantment and to feel a sense of awe. 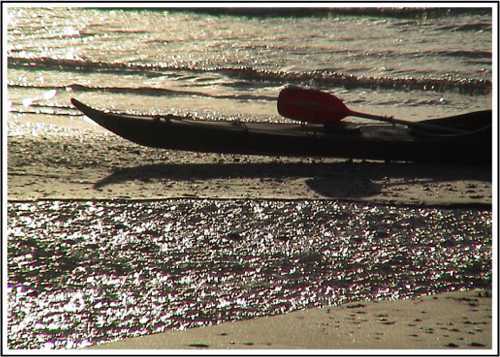 A sea kayak is fast, seaworthy, light and pure sculpture. Fridtjof Nansen, polar explorer, Norwegian diplomat and Nobel laureate, called it "far and away the best one-man boat in existence". If you love rockpools and cliff walks, probably you will love sea kayaking. A kayak is affordable, easy to transport, silent and needs no special courage, strength or reflexes. Leave the beach behind and see what's round the headland. Kayaking is convenient (fifteen minutes to get packed, fifteen minutes to get changed and go afloat) and it is safer than many popular sports. A classic sea kayak is extremely sea-worthy. When properly equipped it will not flood and can be righted in seconds after a capsize. You don’t need much water, so you can have a good time when larger boats must wait for a favorable tide or wind. You can take your kayak anyplace you like, and launch easily and quickly. No need for motor, fuel, batteries, sail-bag, trailer, winch, dolly, mooring, dinghy park or slipway. 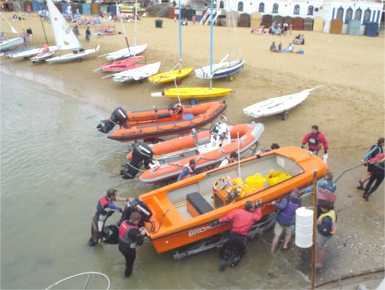 No need for a rescue boat, unlike this seaside sailing club which needs three. Seldom any fees to pay, no coxswain or berth marshal. Anybody can walk or kayak a few miles. A fit person can easily walk ten miles (16 km) or paddle fifteen miles in a classic sea kayak. If you are on a mission you can walk twenty-five miles or kayak forty miles (65 km) although you may not be much use at work the next day. Your own muscles provide the power. On a cold day, the exercise and the fact of being sealed into your kayak are enough to keep you warm, and on a hot day you can just roll in to cool off. Nearly half of sea kayakers are women and kayak manufacturers recognize this. In 2009 Freya Hoffmeister kayaked 9000 miles round Australia. See her site at Qajaq Underground. If kayaking books are often about endurance and terror it’s because “broke my paddle off Tierra del Fuego and had to eat my own shoes” is more interesting than “saw some terns and a seal, got my nose slightly sunburnt, covered a good distance”. Solo sea kayakers have paddled round Newfoundland, Britain, Ireland, Iceland, New Zealand, Japan, the Mediterranean and Australia. A teenage girl from Scotland has kayaked round Cape Horn. Ordinary sea kayaks have made solo open-water crossings of 50 and 60 nautical miles in 24 hours. You can go sea kayaking in a general-purpose kayak. If you go out only on warm seas under a hot sun, you may prefer a sit-on-top kayak but we think a classic sea kayak is best. They are more expensive but they last a long time. Sea kayaking has something in common with mountaineering and mountain-biking. 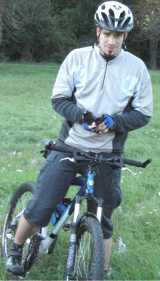 They're all sports which need some training but which you can do at any level that suits you, from easy to extreme. All of them bring you in touch with nature in a way which teaches a certain respect, and they can all easily be done in a new location. Sea kayaking is probably the safest of the three. It's certainly safer than horse riding, scuba diving, motorcycling or paragliding. In 1974 when Derek Hutchinson wrote Sea Canoeing he was able to say "Britain... leads the world in the sport of sea kayaking" but by 1990 the sport was exploding in the USA and Canada, especially in the Pacific Northwest. When Mr H wrote The Complete Book of Sea Kayaking in 1995 he nearly laughed out loud on reading his earlier comment because by then the USA and Canada had more ocean paddlers than any other country in the world. That growth has continued, and sea kayak tourism has become a significant part of the economy of many coastal communities in Washington, British Columbia, Alaska and other places. Sea kayaking has also taken off in quite a big way in New Zealand and Germany, and is presently doing so in France, Spain and other European countries. In Britain, the profile of sea kayaking is not much higher now than it was forty years ago. Which is strange because conditions on the west coast of Scotland are very similar to those in the Pacific Northwest (wildlife, climate and weather, a sheltering chain of islands, inter-island ferries, supplies, cultural history, and a nearby continent full of people increasingly keen to try wilderness kayaking). And there's equally great coastline in Devon, Cornwall, Pembrokeshire and elsewhere. Not that a lack of mass tourism is entirely a bad thing... in 2001 your editor spent five months on Skye and Mull with two sea kayaks on his vehicle and at least one on the water most days. He saw lots of seals, porpoises, eagles, terns, gannets, skua, shearwaters, guillemots (murres), razorbills, puffins, eider and shelduck, some Great Northern Divers, a pod of orca, a few dolphins and otters but scarcely another sea kayaker the whole time. Two sea kayakers seeing each other in the distance would usually get together for a chat, and there was certainly no risk of ecological carnage... innocent days! Rolling a kayak is a basic skill, and easy to learn if you have a good instructor. When you can recover from a capsize in a few seconds, and carry out a deep water rescue of another kayak, your kayaking skills and experience can really take off. • Simple equipment and simple technique are enough. • If sea kayaking turns out to be your thing, you need never stop learning. 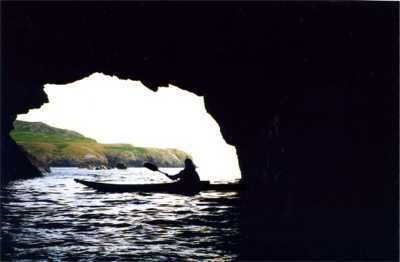 • Sea kayaking makes you identify with the marine environment, which needs all the friends it can get. The Kayarchy website was written and illustrated by Nicholas, who has been crazy about small boats for as long as anybody can remember and started kayaking at age 10. He would like to see more people sea kayaking, especially in coastal communities. Kayarchy is evolving all the time with the help of comments, information and photos contributed by ordinary paddlers and technical specialists. Alan Byde, now living in New Zealand, for the black-and-white technique illustrations, textual suggestions, and information about curragh building. Alan wrote classic 1960s-70s kayaking books including Living Canoeing, Canoe Building in Glass Reinforced Plastic, and Canoe Design & Construction. Alex Ferguson of New Zealand. Kayaker and designer of plywood kayaks. Although he denies it himself, Sandy has been described to us as "one of NZ's top kayaking gurus". Howard Oakley, Head of Survival & Thermal Medicine at the Royal Navy's Institute of Naval Medicine. Author of many published papers on survival at sea plus other medical matters and genetic computer programming. A sea kayaker himself, he turned around your editor's understanding of the hazards of cold water and made textual suggestions about cold shock, swimming failure and hypothermia. Murty Campbell of Stornoway Canoe Club, Scotland, for many photos of kayaking in the Outer Hebrides. See more, including trips to St Kilda, on his flickr page. Orsolya Hetey, kayaker, sailor and jewellery maker, for photos of kayaking and wildlife. Paul Caffyn of New Zealand, sea kayaking circumnavigator, for textual suggestions and a bibliography of books about kayaking and the sea. A writer himself, he recounts his experiences in Obscured By Waves, Cresting The Restless Waves, Dark Side Of The Wave and The Dreamtime Voyage. Richard Best, England, builder of traditional kayaks and baidarkas, for the photos of Greenland and the opportunity to experience traditional clothing and equipment. Several images are courtesy of the US Coast Guard Department of Boating Safety - yellow kayaker, red canoe, red lifejackets, yellow kayak. See Get In Touch, below. Comments, photos and illustrated articles about any aspect of sea kayaking, kayak building, marine wildlife and the coastal environment are very welcome (but please no obvious adverts for your product or service). If you're sending an attachment, please put your message in one mail and attach the photo/document to another one. Statute mile = 1.61 kilometers. Yard = 3 feet = .914 meters. A nautical mile, which is a measurement used by seafarers everywhere, is 1.15 land miles. See The Nautical Mile. Fathom = 6 feet = 1.83 meters. The safe way to take up kayaking is to get face-to-face training from an experienced coach, probably one with a senior coaching qualification. When you have the technical skills, join local kayakers to make trips. Start in sheltered waters and then make increasingly demanding expeditions. The Kayarchy website was put together for fun, to give you some idea what to expect if you go sea kayaking. It is up to you to get suitable training from qualified instructors, and to obtain and check all information about local conditions, local regulations and kayaking equipment. Before using any product mentioned on this site you should read the manufacturer's data sheet. You are very welcome to use this website but on condition that you do not attempt to hold Nicholas or any Kayarchy contributor liable for any loss or damage which you believe was caused by their negligence in providing incorrect or incomplete information, or in providing a link to any other website. As far as the law permits, the same applies to liability for injury or death. It is also a condition of use that if you do make a claim and the courts decide that Nicholas or any Kayarchy contributor is liable, their total liability shall be no more than £1 (one pound sterling) for compensation to yourself or any third party; and no more than £1 for your legal costs and expenses or those of any third party. Any claims or disputes shall be governed by the substantive law and legal procedure of England, and only the courts of England & Wales shall have jurisdiction. Nicholas asserts the right to be identified as the original author of Kayarchy. The text, photos, graphics and design are protected by copyright and may not be reproduced or distributed without written permission. Except in the case of photos contributed by Murty, Orsolya, Richard and others, and the booklist contributed by Paul Caffyn, the copyright holder is Nicholas. "Kayarchy" is a trademark and may not be used without written permission. Kayarchy does not sell or give away any personal information such as e-mail addresses.